This week on 27th September, our students were involved with 71 students of Vasant Dada Patil School (Marathi Medium) & Santulan (NGO working for quarry Miners’ children) for their service learning activities. Ms Sunita Malekar (Secondary Library) & Ms Maria Mistry (Service as Action coordinator) welcomed the students with a brief introduction in Marathi, English & Hindi. Four tenth grade students of Santulan attended the Math coaching class. Vighnesh and Siddhanth from the DP were tutoring. The planned topic for the day was ‘Understanding Math Sequencing’ The students of Santulan were eager to learn and even practiced at each stage coming up to the board and did a lot of exercises in the notebook. At the end of the session, there was an open discussion where it was decided by both groups that in the next class they will come with the list of topics they would need help in. The same group also requested for help in English. It has been decided that both English and Math will be taught to this group. A well-conducted lesson and there was mutual respect and the students left feeling happy. Today was the first Santulan session of the academic year 2017/2018. For the weeks leading up to this day, we had all been planning for this session. Especially since this CAS project is continued from last year, I wanted to really improve on our performance last year and make this year better. One huge benefit was that we were hosting the children this year. This meant that we had access to resources and equipment. Also, it was great exposure for the children to see proper football equipment and also playing on an almost full-size football pitch. We had a small introduction session, where we went over rules and regulations one more time to reinforce them to the children. After this, we gave them a short tour of the school and split up into groups for our activities. Due to rain, we had to host our session in the Multi-Purpose Hall (indoors) and this required some quick thinking. We could not go ahead without usual activities but we had to merge with the other sports group due to the issue of space. We decided to play a game that could involve all the groups. Kickball was a sport that was easy to understand and also fairly easy to set. It also involves a lot of players so we chose Kickball as our fallback sport. After some demonstrations and explanations we started the game and children seemed to enjoy it tremendously. We made sure all of the children were involved and participating. They embraced the change of activity and also the interaction with other children rather than their respective groups. Overall, it was an eventful first session. Hopefully, from next week we can start utilizing the field and other equipment to resume working towards our original CAS Project. Our goal is to have a tournament with other schools once our team starts working well together. Part of the MBIS service learning activity (CCA) there were 40 students from Vasantdada Patil Vidyalaya visited MBIS to interact with our students. MBIS students were very excited and happy to welcome them. Today our students were in a teaching role and taken the charge of the visiting students. There were 3 groups who were active and ready with their plan. The English group students taught Basic English language skills in form of games and the Science group was busy in the science lab explaining students about different instruments..
We have observed that the learning was happening from both the sides. Vasantdada students were little shy but excited to know what is coming on their way. They were very responsive, trying to understand our students. There were communication barrier because of language but the understanding was very good amongst the students. Our students Trisha, Robyn, Menaja, Animan, Renuka, Yugveer, Aryamaan, Meghan played a vital role in managing and taking charge of these 35 students, big thank you to them. I would like to thank Mr.Marc who actively participated and was a great support to our students. Our session got ended with exchange of thanks and promise to visit back again. Due to rains swimming was cancelled but plan B was ready and under the mentorship of Ms Jody and group leader Anushka, the students learnt a new game’ kickball’. There was collaboration between the MBIS student leaders as well the students from Santulan & Vasantdada Patil school as all played together for the first time. 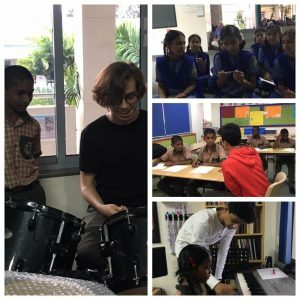 The MBIS students with their effective teaching and learning approaches made sure all the students were engaged, and enjoyed their experiences.